Show creator Greg Daniels announced that the upcoming ninth season of The Office will be its last. I've had a rocky relationship with the show, first hesitant to watch it because I was such a fan of the original British show. I stayed with the show mostly because I loved Dwight's character; there is something dark and disturbed about his character, and I, well, enjoy things that are dark and disturbed. Initially, I enjoyed Pam and Jim's flirtatious courtship, but like many TV romances, the excitement fizzled when they finally got together. At first, you were rooting for these two crazy kids, and then suddenly, it seemed that in the span of only a few episodes, they were married with kids and still working in the same place. Is that what you call a fairy tale ending? Many fans lost interest after Steve Carell's departure, but I saw it as a chance for the minor characters to have their chance in the spotlight, and it's these minor characters that make the show great. Erin (Ellie Kemper), first introduced as simply an airhead, has grown into her own, and Ed Helms, Craig Robinson, and B.J. Novak are some of the best in the business when it comes to subtle comedy and great delivery. If Michael Scott (Steve Carell) does make another appearance, it should be for a quick cameo. There was lots of buildup to him leaving and that would be for naught if he came back, but to give fans some closure, I think this cameo should just give enough information to know what is going on with the character. Can Gabe get a break? I know the intense hatred of him and his mass douchery is much of the enjoyment, but for some reason I'm always rooting for him. Please, for the sake of everyone, do not make Jim and Pam have another baby. They became insufferable after the first one. Hopefully, Robert California will make a clean break. He never really fit in the story, and it seemed the writers never really knew what to do with him. Same for Nellie. Although Catherine Tate is brilliant, this character was too over-the-top and her craziness escalated too quickly. I'm never much of the romantic type, but I am hoping that Dwight and Angela get together. They are both just crazy enough to work out. Oscar seems to be the only competent person in the office. Can the guy at least get his own desk, finally? The best episodes were those that took place outside of Dunder Mifflin: Michael and Jan's dinner party, Benihana, girls' day at the Steamtown Mall, etc. Here's to hoping we’ll see some more field trips in the final season. I loved the idea of Andy (Ed Helms) becoming the new manager, but he seems to be repeating Michael's actions as a bumbling idiot. We saw that for seven seasons, why not make him command some control and gain some respect? All comedy doesn't need to come from incompetence. Give Andy some confidence and success in the job. The show has always been about a slice of a part of these people's lives. 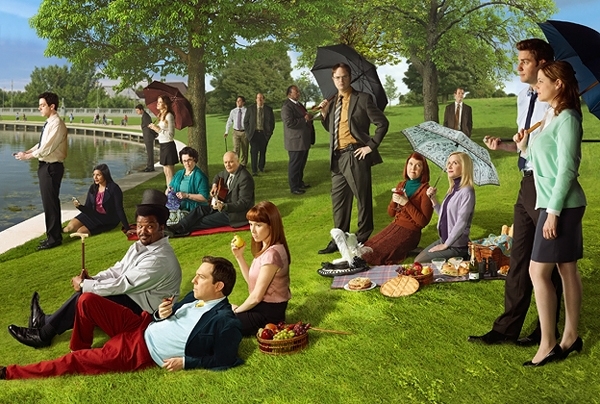 When the show started, the characters had already been a part of the office. When it ends, I don't think everyone needs to get a new job, have a revelation, etc. I hope the show ends with everyone still in their role and Dunder Mifflin intact, so that way in our imaginations the characters will live on, and that Stanley will enjoy Pretzel Day for many years to come.